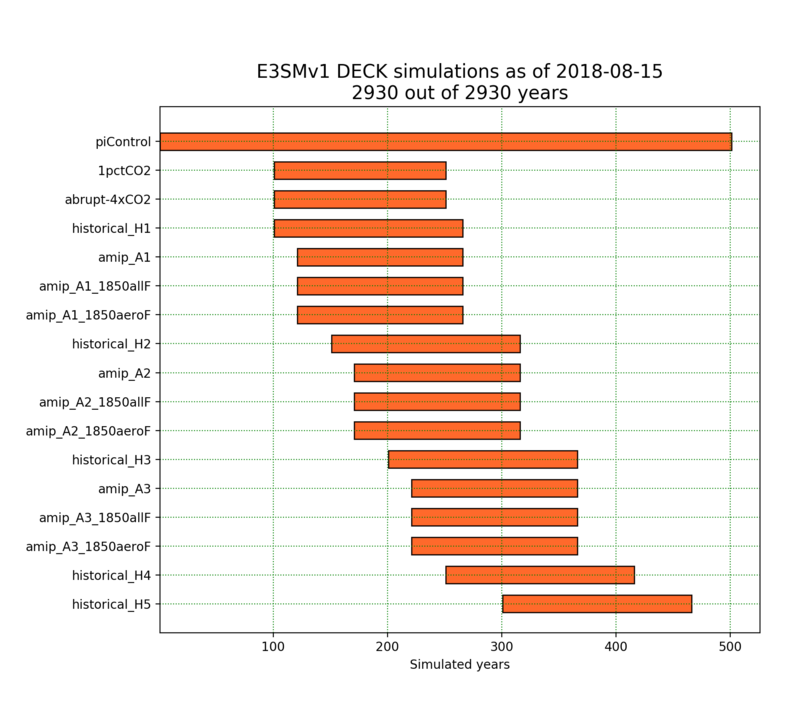 The water cycle DECK simulation campaign for CMIP6 completed almost 3000 years of simulations with E3SM v1.0 at standard resolution (110 km atmosphere/land, and for ocean/sea-ice components: 30 km at the equator, 60 km at midlatitudes and ~30 km or so at poles). E3SM v1.0 standard resolution CMIP6 DECK experiments execution chart. The runs started on Jan 30, 2018 and finished on Aug 15, 2018. The 2930 simulated years were completed with average aggregate throughput of 27.7 SYPD. An overview of the CMIP6 experimental design is available in Eyring at al. (2016, GMD). 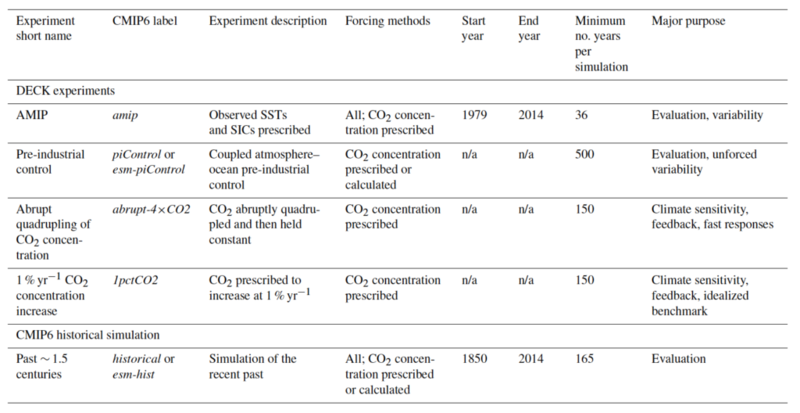 The “entry card” simulations for CMIP6 consist of the DECK and historical simulations as listed in the table below extracted from Table 2 of Eyring et al (2016). DECK Water cycle simulations for v1. The first DECK simulation was the piControl simulation which required a minimum of 500 years. Other experiments were initialized by branching off from piControl at various stages. The scenario is provided in the bar chart figure above. Historical_H1, 1pctCO2, and abrupt-4xCO2 started from year 101 of piControl, amip from year 1870 of historical_H1, historical_H2 from year 151 of piControl and all remaining historical members were spaced 50 years apart (201, 251, 301). Scientists completed 3-member ensembles of AMIP DECK simulations covering the period 1870-2014. In addition to the ensemble AMIP simulations, researchers performed AMIP 1850 all-forcing simulations – the same as amip but keeping all forcing agents at their 1850 values (to compute the time-varying total effective radiative forcing (ERF) between 1870 and 2014) and AMIP 1850 aerosol forcing simulations – the same as amip but keeping aerosol related forcing agents at their 1850 values (to compute time evolving total aerosol-cloud forcing (ERFari+aci)). The 1850 and 2010 configuration runs to test aerosol and climate sensitivity should be completed soon.